I first met Jim Banks nearly a decade ago. He was an IU College Republican then, also working for John Hostettler's campaign. He became President of the CR's a year later, leading the group to a number of milestones. When he graduated, he went to work for Focus on The Family, bringing his passion for right-to-life issues and conservative values to his profession. He returned to Indiana and was elected to the Whitley County Council, and ran Greg Zoeller's campaign for attorney general. He has served on the board of Allen County Right to Life. Now, Jim is running for a seat in the Indiana State Senate and has already picked up some key endorsements including U.S. Representative Mark Souder. Allow me to add my (much less significant) name to that endorsement list. 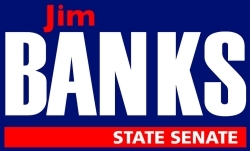 Jim Banks is the real deal. A dedicated pro-life fiscal conservative, Banks endorses every value conservatives hold dear, from resisting attempts to redefine marriage to an enthusiastic defense of the right to keep and bear arms. Unfortunately, I cannot vote for him in May and (assuming he wins the primary) November, but I enthusiastically support his bid for elective office. As Rush Limbaugh has said, conservatism is in an ascendancy. More people are self-identifying themselves as conservatives and are looking for leadership from a weak Republican Party. Sending Jim Banks to the State Senate is what the Republican Party needs to capitalize on conservative resistance to Barack Obama's big-government policies and restore confidence in the GOP's commitment to conservative principles. One of the things I am impressed with most is Jim's promise to "create a better investment environment in our district by looking for ways to reduce the tax burden on businesses." Banks understands what too many politicians do not: that it is the private sector, not the government, that creates wealth. What government needs to do is stop smothering business with oppressive regulations and burdensome taxes. We saw tax revenues increase nationally when Ronald Reagan and George W. Bush lowered tax rates, and that same formula will work for Indiana. The only area where I disagree with Jim is his support for vouchers for private schools. As a graduate of a Christian high school, I fear government money will come with government strings that will be used to restrict the religious liberty of private schools. Government money could well become a corrupting influence that will cause Christian schools to abandon their principles if threatened with a loss of government funding. After all, it is impossible to serve both God and money. (Matthew 6:24.) Tax credits, which Banks also supports, are a viable alternative to help parents pay for the cost of private schools and increase competition in our educational system. I look back ten years and see what a change has been made in state politics. A decade ago, the legislature was reeling from the Build Indiana Fund scandal, the state budget was in shambles and the legislature was in need of reform. While Governor Daniels has made strides in moving Indiana forward, more needs to be done. One of the best ways to do that will be to shake up the State Senate with a principled conservative dedicated to advancing conservative causes rather than simply holding his seat. Jim Banks is exactly that kind of conservative.